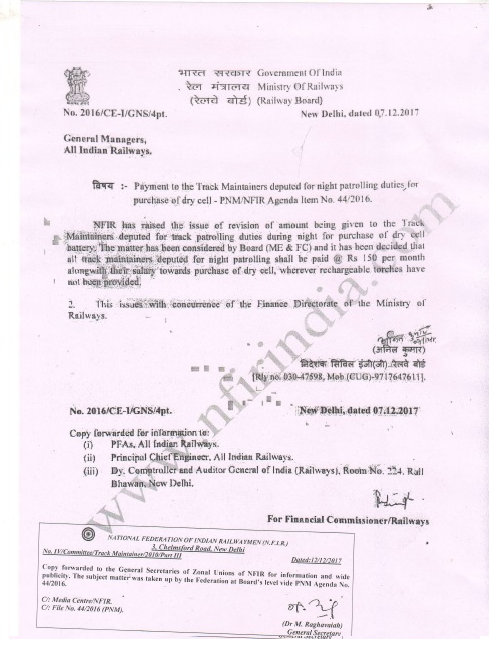 Sub: Payment to the Track Maintainers deputed for night patrolling duties for purchase of dry cell – PNM/NFIR Agenda Item No. 44/2016. 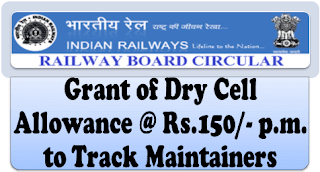 NFIR has raised the issue of revision of amount being given to the Track Maintainers deputed for track patrolling duties during night for purchase of dry cell battery. 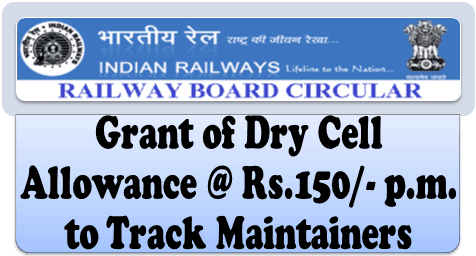 The matter has been considered by Board (MEW & FC) and it has been decided that all track maintainers deputed for night patrolling shall be paid @ Rs 150 per month alongwith their salary towards purchase of dry cell, wherever rechargeable torches have not been provided. 2. This issues with concurrence of the Finance Directorate of the Ministry of Railways.